Hey, remember vTax/vRAM? It’s dead and gone, but with 6 Terabyte of RAM servers now available, imagine what could have been (your insanely high licensing costs). Set the wayback machine to 2011, when VMware introduced vSphere version 5. It had some really great enhancements over version 4, but no one was talking about the new features. Instead, they talked about the new licensing scheme and how much it sucked. While some defended VMware’s position, most were critical, and my own opinion… let’s just say I’ve likely ensured I’ll never be employed by VMware. Fortunately, VMware came to their senses and realized what a bone-headed, dumbass move that vRAM/vTax was, and repealed the vRAM licensing one year later in 2012. So while I don’t want to beat a dead horse (which, seriously, disturbing idiom), I do think it’s worth looking back for just a moment to see how monumentally stupid that licensing scheme was for customers, and serve as a lesson in the economies of scaling for the x86 platform, and as a reminder about the ramifications of CapEx versus OpEx-oriented licensing. Why am I thinking about this almost 2 years after they got rid of vRAM/vTax? I’ve been reading up on the newly released Intel’s E7 v2 processors, and among the updates to Intel’s high-end server chip is the ability to have 24 DIMMs per socket (the previous limit was 12) and the support of 64 GB DIMMs. This means that a 4-way motherboard (which you can order now from Cisco, HP, and others) can support up to 6 TB of RAM, using 96 DIMM slots and 64 GB DIMMs. And you’d get up to 60 cores/120 threads with that much RAM, too. And I remembered one (of many) aspects about vRAM that I found horrible, which was just how quickly costs could spiral out of control, because server vendors (which weren’t happy about vRAM either) are cramming more and more RAM into these servers. The original vRAM licensing with vSphere 5 was that for every socket you paid for, you were entitled to/limited to 48 GB of vRAM with Enterprise Plus. To be fair the licensing scheme didn’t care how much physical RAM (pRAM) you had, only how much of the RAM was consumed by spun-up VMs (vRAM). With vSphere 4 (and the current vSphere licensing, thankfully), RAM had been essentially free: you only paid per socket. You could use as much RAM as you could cram into a server. But with the vRAM licensing, if you had a dual-socket motherboard with 256 GB of RAM you would have to buy 6 licenses instead of 2. At the time, 256 GB servers weren’t super common, but you could order them from the various server vendors (IBM, Cisco, HP, etc.). So with vSphere 4, you would have paid about $7,000 to license that system. With vSphere 5, assuming you used all the RAM, you’d pay about $21,000 to license the system, a 300% increase in licensing costs. And that was day 1. Now lets see how much it would cost to license a system with 6 TB of RAM. If you use the original vRAM allotment amounts from 2011, each socket granted you 48 GB of vRAM with Enterprise Plus (they did up the allotments after all of the backlash, but that ammended vRAM licensing model was so convoluted you literally needed an application to tell you how much you owed). That means to use all 6 TB (and after all, why would you buy that much RAM and not use it), you would need 128 socket licences, which would have cost $448,000 in licensing. A cluster of 4 vSphere hosts would cost just shy of $2 million to license. With current, non-insane licensing, the same 4-way 6 TB server costs a whopping $14,000. That’s a 32,000% price differential. Again, this is all old news. VMware got rid of the awful licensing, so it’s a non-issue now. But still important to remember what almost happened, and how insane licensing costs could have been just a few years later. 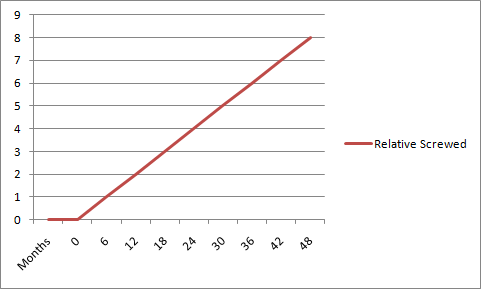 My graph from 2011 was pretty accurate. Rumor has it VMware is having trouble getting customers to go for OpEx-oriented licensing for NSX. While VMware hasn’t publicly discussed licensing, it’s a poorly kept secret that VMware is looking to charge for NSX on a per VM, per month basis. The number I’d been hearing is $10 per month ($120 per year), per VM. I’ve also heard as high as $40, and as low as $5. But whatever the numbers are, VMware is gunning for OpEx-oriented licensing, and no one seems to be biting. And it’s not the technology, everyone agrees that it’s pretty nifty, but the licensing terms are a concern. NSX is viewed as network infrastructure, and in that world we’re used to CapEx-oriented licensing. Some of VMware’s products are OpEx-oriented, but their attempt to switch vSphere over to OpEx was disastrous. And it seems to be the same for NSX. One Response to Hey, Remember vTax? I agree on the OpEx licensing for NSX. It’s a great technology, but not at $48 per month per year per VM (which was what we were told back in Oct last year). If they tied it to say about half the cost of a CPU license for the edition you are running, with the SnS set to the same proportion, I’d have been all over it. I’m now actively looking at using the Nexus 1000v and straight VXLAN to do our networking – it won’t be as good, wont have the features of NSX, but it also won’t bankrupt us. And if we get it working, we probably won’t be looking at NSX for the next 3 or 4 years – hopefully by that time, they will have come to their senses and set sensible prices (and won’t have been beaten out for market share by ACI etc).